I hope everyone enjoyed the festivities this past week! This will be my last post for a while, as I’m going on my “blogcation” (which will probably be at least a week). For those of you who get the RHS email alerts, they’re automated and sometimes go out when there’s no new post, so if you get one and there’s nothing new on the blog, it’s some sort of fluke. For now, I leave you with a few last holiday goodies. 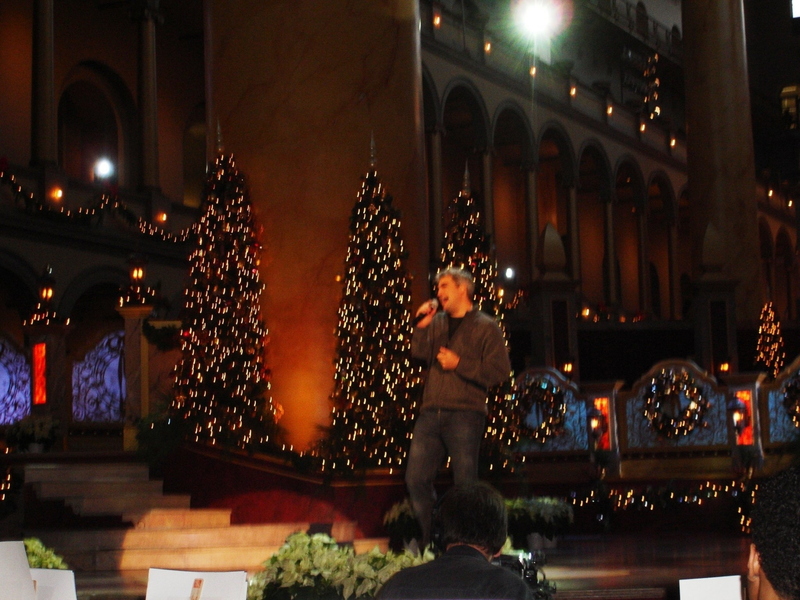 First, a video of my favorite Taylor Christmas performance, which is from The Early Show in 2006. Below that are some pictures with some nice “Christmassy” backgrounds. And just for funsies, click here if you want to track Santa on Christmas eve! Great pics, Tays! 🙂 Have a nice blogcation, you will be missed. The pictures are all fantastic as usual. The last one is classic holiday Taylor, all the way . 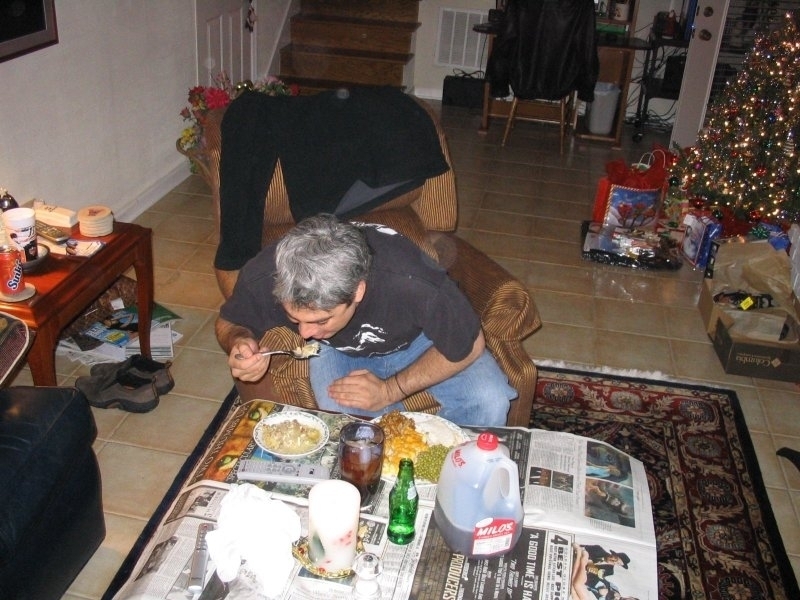 . . remember trying to figure out what was on his plate, and which movie was being advertised in that newspaper? I’ll definitely be tracking Santa on the Norad site. Because, well . . . how else will I make sure I’m in bed on time? I don’t want him to skip my house because I’m not nestled in my bed with visions of sugar plums dancing through my head. Bloggerina, have a nice blogcation, and the most wonderful holidays ever! I’ll be burning a special yule log and waiting patiently for your return. And, of course, my holiday wishes go out to all my fellow commenterinas, and the lurkerinas too! Enjoy your holiday. Merry Christmas! OK Everybody…lay out the newspapers- Taylor’s comin’ fer dinner!! Thanks so much for these and all the wonderful treats you’ve given us this past year, TH- have a fantastic Christmas- God bless!! Happy Holidays to TaysH and all of the elves that visit RHS! Have a wonderful holiday TH! Thanks for that video. I absolutely love how he does this song! I love that last pic! Everytime I see it I try to figure out what he’s chowing down on! I wish all my fellow RHS members a very blessed holiday and to our Bloggerina, thank you for a glorious year of all things Taylor! We’ll see everyone in 2009–including our very own Soul Man on tour! Everyone have a Merry Christmas and a Happy New year, best wishes for the exciting year to come. Loved the video, pictures are great, have a wonderful Christmas, and thanks for all you do!! Have a good blogcation! You’ve earned it! Happy Holidays to everyone! I hope and pray that the New Year brings peace, and all the love and happiness you all can hold! I know it will be full of great things for Taylor too! I think I’m the only person in Taylorland that has never seen that video. Wow…how awesome is that!! Got my blood pumping this morning. I will be dreaming of a “White Haired Soul Man” for Christmas. Well that is, great things for him in 2009. Merry Christmas to everyone here and big thanks once again to TaysHarmonica for all the hard work she does for us to enjoy the visual greatness we know as Taylor Hicks. Love the tablecloth in #12. Wonderful Christmas pics – brings back great memories of Taylor in NY & DC. Hope everyone has a very Merry Christmas or Happy Hannukah! I meant picture #6. Don’t ask me where 12 came from! Always get a kick out of the pigging out picture. I do recall folks trying to figure out what exactly he was eating. Cute. I love the jug of tea on the table. Enjoy your holidays Tays. Your the best! I :heart: all these adorable pictures — especially #1, 2, & 3. Thanks so much for all you do! Merry Christmas everybody!!!! Wonderful video. The real Taylor. Wow. Thanks for that. Merry Christmas, tays and RHSers. See you all again the first week of January? Love this video and especially the scatting. The picture of Taylor eating makes me laugh because my son has to have a bottle of soda right next to him when he eats…must be a man thing to wash down food with gallons of fluid. Thanks TaysH for all that you do for us…this is the best blog!!! Merry Christmas/Happy Holidays to all!! Enjoy your break TaysHarmonica – special thanks to you for your wonderful daily “art gallery” 🙂 Best wishes to everyone here for a very Merry Christmas and a great new year! Enjoy your holiday, TsH. I love the pictures everyday and look forward to more treats in 2009! What a wonderful way to start Christmas week!! Have a great blogcation. I, too, will be gone for a week. Everyone, Merry Christmas and the happiest of holidays! Merry Christmas TaysH and everyone else, including Taylor!!! Thanks so much for this great site!!! Am I the only one that had never seen the picture of Taylor eating that meal? Dressing with turkey, mashed potatoes and gravy in the bowl. Mac and cheese, sweet peas, rice and a crandberry relish on the plate. JMO. Again great pictues. Have a great time on your break. Waiting with joy in my heart for your return. Ooh me LOVES #’s 2,4,&5 # 2 being my ABSOLUTE FAVE 🙂 THANKS FOR THE FAB PICS BLOGGERINA MERRY X-MAS TH & EVERY1 HERE HAPPY HOLIDAYS 1 & ALL W/MUCH LOVE FROM MY FAM TO YOURS XOXOXOXOXOX !!!! Scarfs and hats, and some great fitting jeans. Shorts to ogle, if you know what I mean. Shirts that boast of red, blue, and white. And shoes that glow, oh what a sight! Or the set of guitars he likes to strum. And a well placed mic to make us all moan. Enjoy your time off and be back soon! on December 22, 2008 at 1:03 pm | Reply J.
Merry Christmas and Happy New Year! Thanks for the pretty pictures. In the last one, I think he’s eating peas, mashed potatoes, something that looks like a piece of meatloaf, and maybe cheesey grits or cheesy potatoes? And i dont know whats in the bowl. Maybe some kind of soup, I’d guess? P.S. Love that poem, MN Sue! Too cute!! I love that video! I’ve watched it four times. Thank you! I just love picture number four and the last one too! Best to all of you and your loved ones!!! Here’s to a music filled 2009!! Strangely, what occured to me as I looked at the pictures was the story about Taylor being a young teenage boy and the band who was mentoring him put a white hat on him and pushed him on stage. Taylor , you’ve come a long way. Merry Christmas everybody !!! Taylor always manages to put a smile on my face!! I think that’s why we all fell in love with him!! The guy just puts us all in a “happy place”!! Thank you soooooooo much for this I can not believe it has been sooooooo long since we heard him sing White Christmas in NYC. I sooooooooo miss seeing him and hearing him. Have a wonderful Christmas and Taylorfilled New Year!!!!! Thanks for making this blog a place where we can find happy comments, fantastic photos, and a pleasant “head mistress”. Enjoyed every daily fun-filled blog. Here’s wishing you and yours a Merry Christmas, Happy New Year and many more days of fantastic photos. Merry Christmas to everyone here at RHS!! I have loved Taylor’s White Christmas so much….the most original take on an old favorite! Thanks for your gift giving all year, TaysH. Your blog makes it year-round Christmas for us all. I ‘m going to agree with Sarah,Taylor always puts a smile on my face.I love the pictures and hope all of you have a very Merry Christmas and a Happy New Year. Have a great blogcation, too…send us postcards ,we’ll miss you ! i hope that everybody has a wonderful christmas tomorrow! Just popped in to catch up on reading comments . . . Merry Christmas to everyone. Oh, and I’m tracking Santa. He’s currently in Omsk, Russia! Accckkk, I can’t believe that it took so long for me to post a comment, with all the holiday last-minute rush. But, I wanted to take a minute to thank TaysH so very much for the hard work that she puts into this effort every day, with us the lucky recipients reaping the reward of happiness and positivity. The daily picture galleries put up this week especially have me in both a festive and peaceful mood. From today’s gallery, I love #4 best of all — that one just twinkles. We have a lot to look forward to Taylor-wise in 2009, from a new album to the continuing Grease tour to the club shows. It’s a time of great excitement and anticipation and I hope that even more people who come here to this site “just to look” decide to take the plunge and post and join in the daily fun. In the meantime I wish everyone in the RHS community — lurkers, posters, and most especially the bloggerina — a happy, fun, silly, and restful holiday. Well, shoot! Look at all the fun I missed while I was away dealing with a family crisis. All is well for now, but at the time even Taylor photos couldn’t help me deal with this one. But, here’s the good news. Because I’ve been such a good little mother (MOTHER, not mutha), talking my son off the ledge (so to speak) and stressing myself to the max, I’ve earned one free get-away of my choice. And guess where I’m going? I’ll tell you about it after it happens. Yep. And you’re one of them, Sue. Thanks for your e-mails. I think I speak for everyone when I say, I really miss RHS! You don’t know what you’ve got till it’s gone. Heavy sigh . . . I know what you mean, soulaz. I feel like Pavlov’s dog. Internet connect = RightHicks check. I’m with you, ladies. I check in everyday (multiple times) to see something new about “him”. I hope you’re enjoying your time off. Have a VERY Happy New Year! I look forward to sharing it with you. I think Pavlov’s dog is a good analogy here because we’ve been trained very well by our bloggerina to keep returning for the goodies. we like.we love it. we want lot’s more of it. P.S Awaiting your return…. I’m glad you are getting to enjoy some time off, Tays, but I’m really missing your updates.